Prepping: The very tip of a shoot (first 1 1/2 inch), the flesh is tender and requires no peeling, but the other end (closer to the roots) requires it. You will be cutting the tender part of the shoots 1 1/2 inch (4cm) long parts. 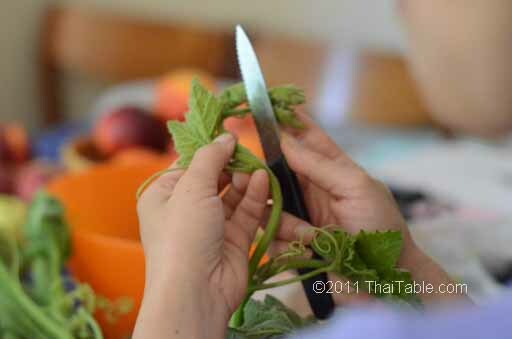 Start at the tip, remove and discard any tendrils, cut 1 ½ inch from the very tip and place in a container. Remove fuzzy skin below by taking a little piece and peeling down toward the other end. A big long piece of skin should come off. Go all around until all the fuzz is gone. Cut another 1 ½ inch when the peel is removed. Remove any leaves that are open and big, they will resemble sand paper. The young and unopened leaves are tender and great. Keep the baby pumpkins. Repeat the process until you reach the end. Toward this end, the shoots can be fibrous and old; discard any that seem too tough. The weight ratio of cut and cleaned shoots to waste is consistently 1 to 1. My bundle weighs around 1 ½ pounds, I seem to always get exactly ¾ pound of the cleaned shoots. 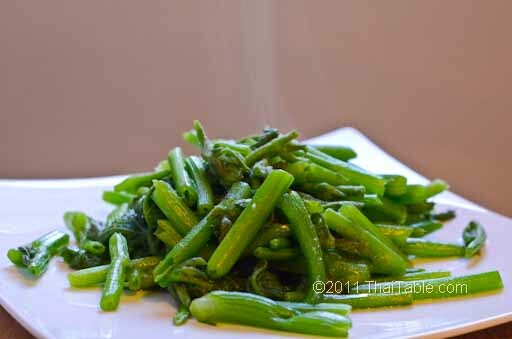 If you are storing the shoots for later use, do not rinse now. Rinse before cooking to keep the shoots fresh longer. When you are ready to cook, rinse the shoots and drain the water out. 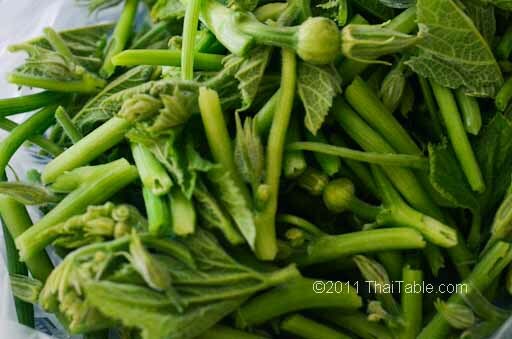 You want the shoots to be as dry as possible so that they are cooked in oil, not steamed in water. Chop 3 cloves of garlic. 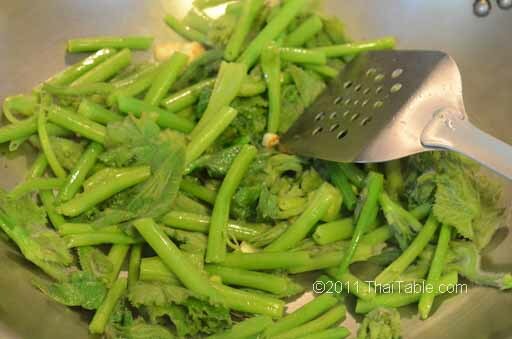 Place garlic and 1 teaspoon of salt on top of the shoots. When the wok is ready, everything will go in at once. Cooking: This takes just 2 minutes. 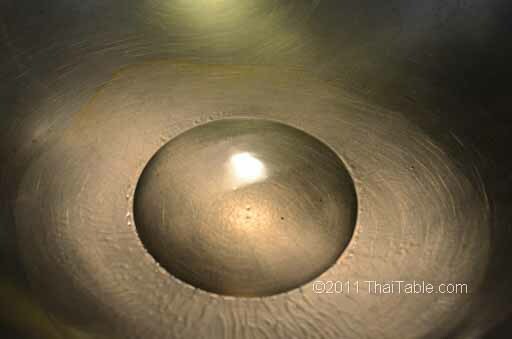 Heat your wok or pan up to be very hot. I let my wok sit on the fire for 5 minutes. When your wok is ready, add 3 tablespoons of oil. When you see smoke, put the shoots, garlic and salt in all at once. 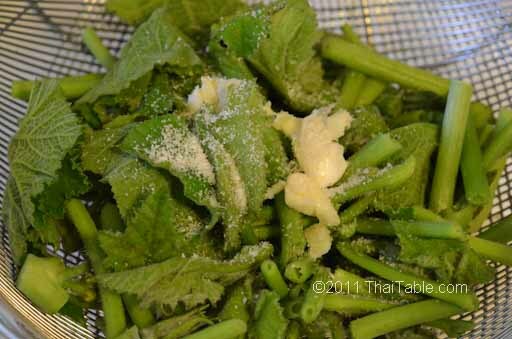 Stir around so that salt is evenly distributed and the shoots get a chance to cook. Your pumpkin shoots should be ready in 2 minutes.